I am a wedding and portrait photographer in the New Orleans area. The very first wedding I photographed as a lead photographer was in January 2007. 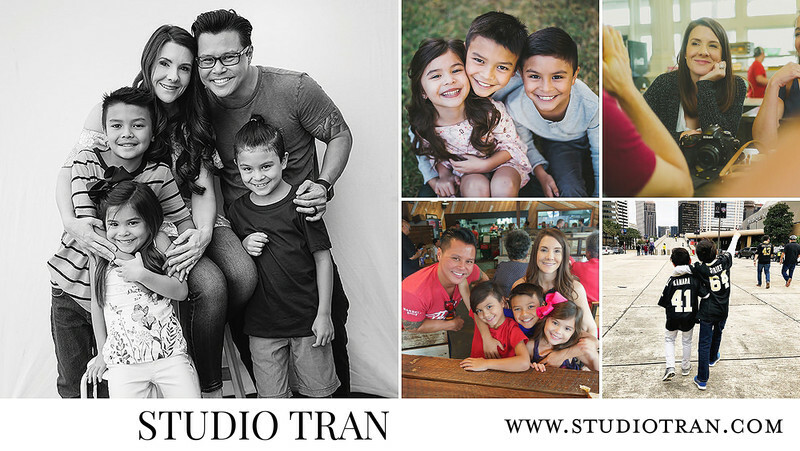 As of 2018, I have photographed over 550 weddings as a lead photographer for Studio Tran and over 700 as a lead and 2nd photographer. Yes, I actually sat down and counted them. So where did this all start with my love of photography? I wouldn’t say that I have always had a passion for photography or that when I was little I picked up a camera and someday dreamed of being a photographer. When I was little I was too busy climbing trees and riding horses to care about taking pictures. And then when I got older I went off to college and still didn’t give it a great deal of thought. Where did I go to school? I have learned since moving to the New Orleans area that when someone asks you where you went to school they don't want to know where you went to college but where you went to high school. So where did I go to high school? Well, I am from California and I went to Menlo Atherton High School located in Atherton, CA. For those of you who want to know about my college standing, I graduated from Tulane University with a Bachelor of Arts degree. I think like many people I was unsure of what I really wanted to do or what my calling in life was, if anything. I think some people are lucky and know from a young age exactly what they want to be and do. It took me a little longer to figure that out. I had to experience different things, travel and move around the country before I knew what I wanted to do. And it wasn’t until after Beebe and I were married that we both took up photography together. That was when I finally thought to myself, this is it, this is what my professional calling in life is to do. Beebe and I met in 2002 and we were married March 12, 2005. Our own wedding took place at the St. Louis Cathedral in New Orleans with reception following at Pat O’s on the River. I am fortunate to have a career that involves my husband and that we both enjoy doing together. We have 3 children, Ethan, Aiden and Mia, who I like to think are just the cutest mini Beebe's to walk the planet. Well, they better be the only mini Beebe's out there or NOLA, we'll have a problem! They certainly make our life interesting, crazy, beautiful, funny and amazing! I like to think of myself as a professional mommy, but hey let’s face it, this is a learn as you go job. At first it was all about just keeping these tiny humans fed, clean and most importantly alive! But now we have entered the much more difficult realm of navigating through the treacherous waters of homework, growing pains, where to send them to school (if you live in the area you will understand what a nightmare our school systems are), who took whose toy, social media monitoring and electronic for kids. Some days Beebe and I don’t know what we are doing, but when we crawl into bed at night and get those snuggles from them, we figure we must not be doing too bad. We also have 3 more family members of the four-legged kind: 2 dogs and a cat. They don't require very much at all these days. A little bit of water, food and pets and they are good to go. When I’m not running after my little spawn, I love relaxing on the beach. Yeah it sounds totally cliché but it is really relaxing! Unless my kids are with me. Then all means of relaxation goes out the window and I become a life-guarding, sunscreen Nazi, do we have enough snacks, stop eating the sand, oh crap is that shark, neurotic mamma. OK, so I used to like relaxing at the beach. We have recently discovered that we enjoy going to the Mountains, playing in the cold water and going to Dollywood. So I might be hanging up my beach towel for now, unless Beebe and I can get an adult trip away. I do love Netflix, Hulu and Amazon, and am always seeking to find new shows to binge watch. I am sure you can only imagine how rare that is with 3 children running around and running a business, but I do find some time at night. We love finding shows that we can watch together, like Stranger Things! When is that coming back on?! How many more seasons will it have? The kids are just as excited as I am about it! Embarrassing tidbit - While in college I got a job working in a dental office. I only worked ONE day. My very first day I was learning how to assist the dentist and he was giving someone a shot in the mouth. Next thing I knew I opened my eyes and everyone was standing over me. Yep, I passed out.